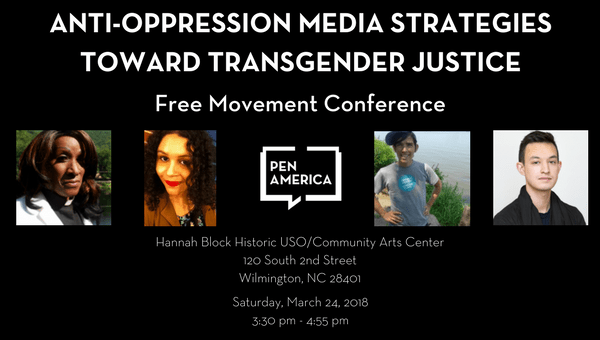 Media has played a powerful role in advancing transgender justice and equity by providing deeper information about systemic injustice, elevating historically excluded and endangered voices, and offering a more inclusive vision of our communities. However, media makers and journalists can do more to build anti-oppression values into their work. What can the media community do to more closely engage transgender advocates, and support transgender journalists? How has media coverage of transgender experiences been narratively limited? What considerations can journalists be making about their language, process, and person-to-person engagement? In this interactive discussion, we heard from panelists Gabrielle Bellot, Kyle Dacuyan, Rev. Debra Hickman, and Lewis Wallace on these questions and more. Gabrielle Bellot is a staff writer for Literary Hub. Her work has appeared in publications including The New Yorker, The New York Times, The Atlantic, Shondaland, and more. Her writing tends to focus on global literature, LGBTQ+ identities, literary history, exile, the Caribbean (broadly), and what it might mean to navigate the world as a multiracial transgender woman of color. Bellot holds both an M.F.A. and a Ph.D. in Fiction from FSU and currently teaches classes at Catapult. She currently lives in Brooklyn, NY. Kyle Dacuyan is the senior manager of literary outreach & activism at PEN America, where he facilitates partnerships with other cultural and advocacy organizations and leads PEN America’s community engagement funding for members, writers, and other allies. He currently manages the Press Freedom Incentive Fund, a resource for locally-led projects on issues around media truth, representation, information access, and local news viability. He engages writers in public action and other forms of advocacy, and has previously been an organizer for LGBTQ+ rights and immigrant justice. Reverend Debra Hickman is co-founder/CEO of Sisters Together And Reaching, Inc. (STAR), a faith-based, nonprofit community organization that provides spiritual support, direct services, and prevention education to HIV/AIDS infected and affected African-American women and men. Rev. Hickman has a Masters of Divinity from Virginia Union University and serves as assistant to the pastor at City Temple of Baltimore Baptist. She is a current appointee on the Mayors HIV Commission and a two-time appointee by the White House Secretary of Health to serve on the Centers for Disease Control and Prevention/Heath Resources Service Administration Advisory Council (CHAC). Lewis Wallace is an independent writer, editor, and multimedia journalist. He is the state politics editor at Scalawag and has previously worked for public radio’s Marketplace in the New York bureau. Before that, Lewis was the economics reporter and managing editor at WYSO Public Radio in Yellow Springs, Ohio. Lewis got a start in radio as a Pritzker Journalism Fellow at WBEZ in Chicago.